SOUL FOOD FOR YOUNG ADULTS: February 10, 2013: Fifth Sunday in Ordinary Time. LETTER TO SINEAD AND MARK, – two young adults. 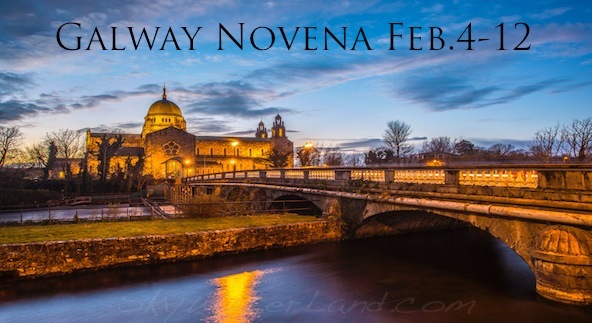 This past week, I’ve been in Galway City, at the annual Solemn Novena in Galway Cathedral,- the annual nine days of prayer in honour of Mary, the Mother of Perpetual Help. A sight to behold,- about 12,000 people each day, coming to one of the six sessions, the first one at 7.45am, the last beginning at 9.30 at night. All ages are there, with plenty of college students coming to the sessions. It’s good for the heart, especially it is so easy to get disheartened and cynical in the face of so much wrong stuff going on in society. 'crowding around Jesus to listen to him'- Photo from the South of France. to him. ‘Like sheep without a shepherd’ was how it was described in another part of the Gospels. 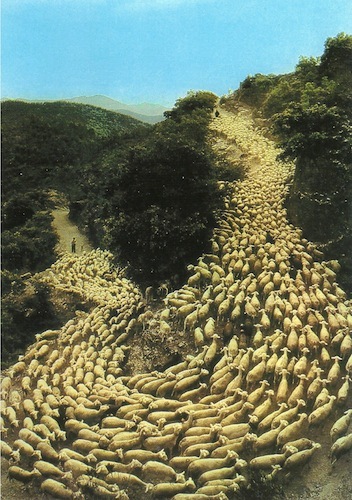 (See the photo,- a post-card from the south of France,- thousand of sheep with their shepherd.) Why the hunger? Why the enthusiasm ‘to hear the word of God’? What was the magnetism that Jesus had that so many people travelled, some from great distances, in order to hear him speak the word of God to them? We’re not told anything of what he said to them, when he sat and taught them from the (safety of !) the boat. But what he did next really spoke to them all,- they saw Simon Peter and his companions struggling mightily with the enormity of the catch of fish, so much that the two boats were down to the gunnels in the water, with the amount of fish. What does that say about Jesus and his words? As always,- filling us to overflowing with what he so wants us to have! If our hearts launch out into the deep, and if we put out our ‘nets’ for the word of God, we will be filled with an amazing catch. And if we go and tell others what happened to us, they too will experience that great catch of joy. He’s inviting each of us, you Mark, you Sinead, and myself, to ‘launch out into the deep’. That’s what’s going on in Galway, these nine days,- from Feb. 4th to 12th inclusive. ‘Flocking around Jesus to listen to the word of God.’ Join us in prayer if you can’t be there! Have you got your own St. Luke’s Gospel? Easy to get one, even on line. This is the Year of Luke,- it’s the Gospel people seem to love the most. ← SOUL FOOD FOR HUNGRY ADULTS: FEB.3, 2013. FOURTH SUNDAY IN ORDINARY TIME.